A heating oil delivery truck advertises a price of $2.72 per gallon while making deliveries in Thursday, Oct. 11, 2018, in South Portland, Maine. 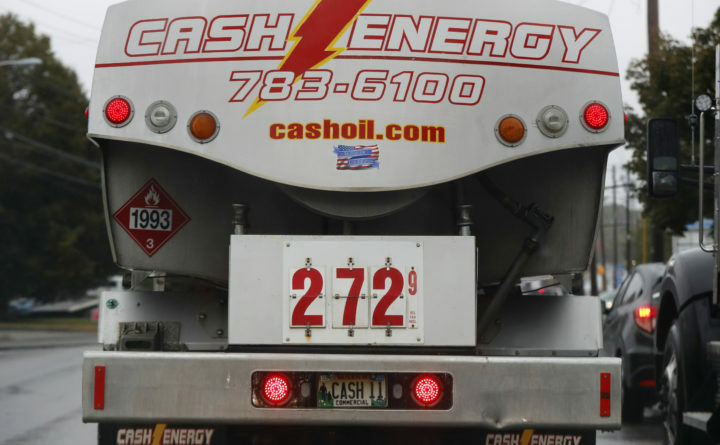 Heating fuel prices stayed relatively flat the week of Dec. 10 compared to the previous week, although heating oil is down 5 cents per gallon since early November, according to the Governor's Energy Office. Heating fuel prices stayed pretty much the same the week of Dec. 10, compared to the previous week, but they were down compared to early November, according to the Governor’s Energy Office’s weekly heating survey. The statewide average cash price for No. 2 heating oil was $2.96 per gallon on Dec. 10, down 1 cent since Dec. 3 but lower by 5 cents since the $3.01 on Nov. 5. The average statewide kerosene price is 1 cent higher than last week, but 6 cents lower than Nov. 5. It is now at $3.55 per gallon. Propane prices have remained essentially the same in the $2.88 to $2.89 range since late October. Heating oil prices were the highest in central Maine, while kerosene and propane were both the highest in southwestern Maine.